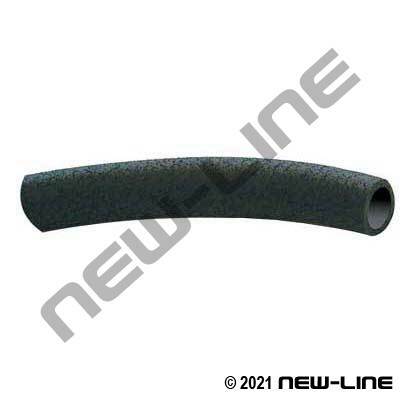 NL2480 is an economy grade water weeping or drip soaker hose that is used for basic irrigation applications (short lengths only) by allowing the water to slowly penetrate the wall of the hose and soak into the ground. It is a light duty hose that is NOT designed for industrial applications, long-continuous lengths, driven over, abused, and due to the nature of its construction, it is susceptible to performance changes from year-to-year in hot or cold climates, lengths, water pressures, duration of watering, etc. Compared to precision irrigation systems, NL2480 does not provide highly controlled or accurate irrigation, and the weeping or spraying pattern is highly dependent on water pressure. It is resistant to moderate heat, weathering, and ozone. We normally stock it in assemblies with male x female garden hose ends, but it is also available in bulk lengths. We offer two brands, A2480 Standard and A2481 Branded Gilmour. Typical Fittings: Brass N505-BR or nylon N505-BR garden hose fittings, brass FBL ferrules, N66 pinch clamps, N64 gear clamps (below assemblies comes with an end cap). Construction: Tube: Black, sponge-type synthetic material for weeping. Cover: Black, sponge-type synthetic material for weeping. Reinforcement: None.